Every program usually has some kind of data movement. This is the ability to transfer information from one area of the controller to another. The Omron CP1H series of programmable logic controllers provide several different ways to manipulate this information. We will be looking at several different ways in which data movement can happen with some programming examples. Data movement in the Omron CP1H does not care what is in the bits that make up the word. It will just send or receive this information. Remember that it is usually the instruction used, that determines how the information in the memory is determined. We will be covering several different data movement instructions. A full explanation can be obtained by using the help menu in the CX-Programmer software or the Programming Manual for the CP1H. Links are provided at the end of this post. 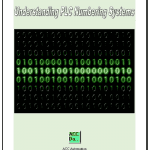 MOV(021) when used will be scanned and executed every cycle of the PLC that the input condition is on. @MOV(021) when used will be executed when the input condition turns from off to on. This will trigger the instruction to happen only once. !MOV(021) when used will do an immediate refreshing of the information before the move takes place on every scan.
! @MOV(021) when used will execute only once for a transition from off to on and do an immediate refresh of the information moved. Please refer to the programming manual or help file in CX-Programmer for different variations of the instructions that you want to use. We will now quickly go over the data movement instructions in the Omron CP1H. 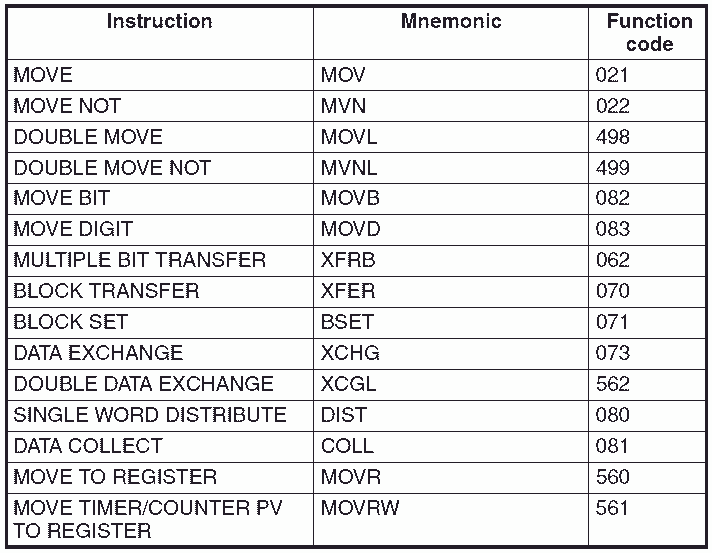 This move instruction will transfer 16bits at a time from the source to destination location. This move not instruction will transfer 16 bits after to changes all of the 1 to 0 and 0 to 1 in the word. This will complement (inverse) the information before moving the source information to the designation. This double move instruction will transfer 32bits at a time from the source to destination location. This move not instruction will transfer 32 bits after to changes all of the 1 to 0 and 0 to 1 in the double word. This will complement (inverse) the information before moving the source information to the designation. This instruction will move the specified bit from the source to the destination. The control word consists of 00 to 0F for the destination bit and 00 to 0F for the source bit. 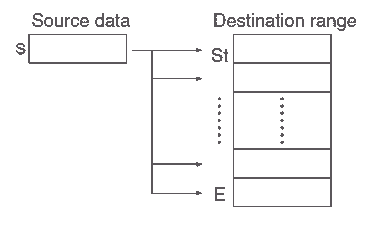 Example #0401 – Move bit 1 in the source to bit 4 in the destination. Example: #0201 – Move one digit from the second in source to the third in the destination. Example: #0171 – Move one bit starting from bit 1 in source to bit 7 in the destination. This instruction will transfer the specific number of consecutive words from the source to the destination. This instruction will copy the same word to a range of consecutive words from the starting word location to the ending word location. This instruction will exchange the data between the words. So the information in the first word will be put into the second. The second word information will be put into the first. This will transfer the source word to the destination word. The destination word is determined by adding an offset value to the base word. This will transfer the source word determined by adding an offset and putting it into the destination word. This will set the PLC memory address of the specified word or bit into the index register location. 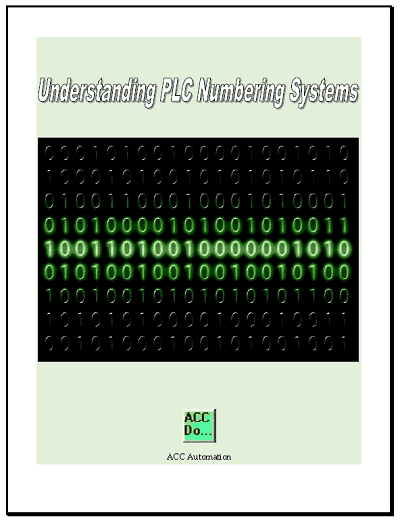 This will set the PLC memory address of the specified timer or counter present value (PV) to the index register. You can see that we have many different instructions to move data in the Omron CP1H. This should give you a good idea of what is possible. See the YouTube video below on data movement in the Omron CP1H PLC. Next time we will look at compare instructions in the Omron CP1H PLC.